In the Hindu religion, there is a strong spirit energy called Kundalini. It lives in all people but nearly always sleeps, curled like a snake near the bottom of their spine, in the first chakra. If it ever wakes up, it climbs the spine and the other chakras, and the whole body and mind of the person fill with energy and understanding. This feels so special that people cannot find words to say what it is like. Some people try to wake kundalini up by meditation or yoga. A person with awake kundalini can help, by sending energy to them. This is called shaktipat. Kundalini is a Hindu name, but ideas that are nearly the same come from all around the world. Some of these are the Taoist 'greater kan and li', Egyptian 'sekhem', Hebrew 'shekinah', Christian 'Pentecostal fire', Kaballist 'secret fire' and Kalahari 'num'. ↑ Swami Satyananda Saraswati. 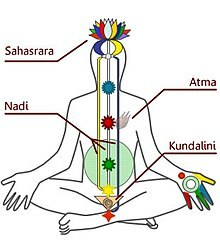 Kundalini Tantra. ↑ Eastman, David T. (1985): "Kundalini Demystified", Yoga Journal, September 1985, p.38, California Yoga Teachers Association.